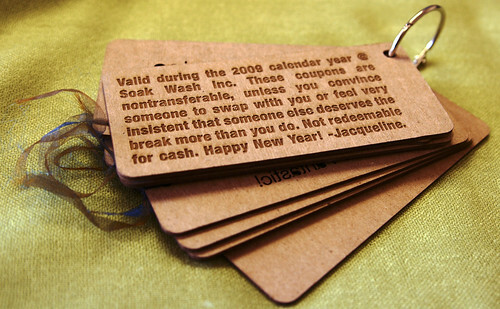 Homemade coupons are a great inexpensive and thoughtful gift idea. 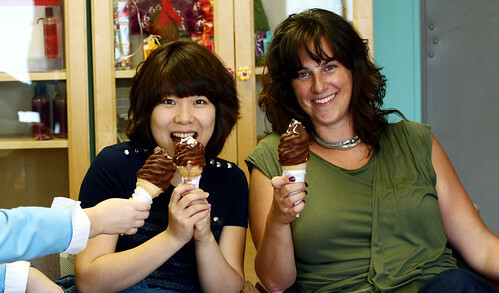 Jacqueline is the creative one in the office and has often wowed us with her fun craft ideas. If you’re stuck on a last-minute holiday gift, or perhaps you’d like to plan ahead for Valentines day or for a birthday, perhaps take a page from Jacqueline’s book and gift one of these cute DIY coupons. 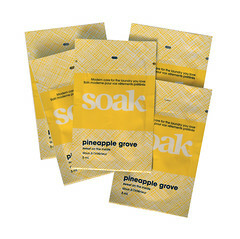 Adding a few fun touches can give your paper coupons just what they need to really make a visual impact. 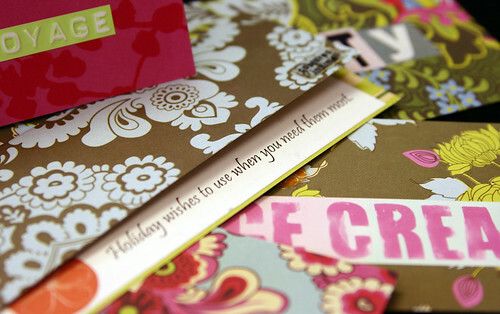 Using scrapbooking paper and stickers are a quick and easy way give your coupons a clean and stylish look. Think of what you want each coupon to offer in advance. Printing them out on a printer instead of handwriting will give it a more professional look. When choosing your paper, keep in mind what color scheme you’d like to have and pick designs and colors that complement each other. To keep track of which coupons have been redeemed, each one has a line that the gift giver can sign after each redemption. 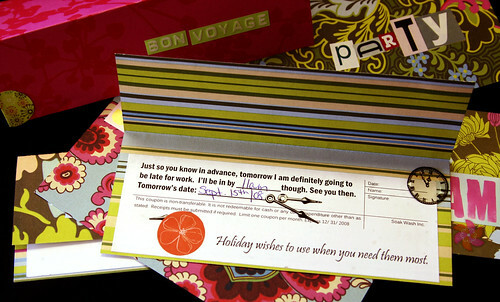 The paper used here was based Amy Butler’s designs. 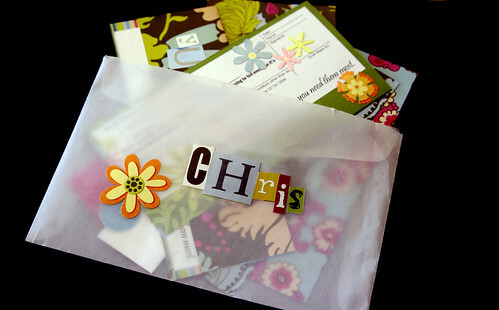 Finish by putting them all in a nice envelope, dressed with the recipient’s name. Jacqueline visited Karen at The Workroom when she made these great cardboard vouchers. An Epilog laser cutter was used to engrave these fun messages and cut out the letters. 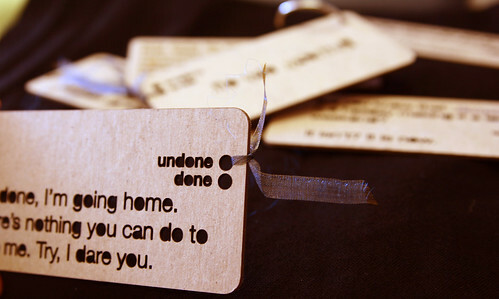 To keep track of which vouchers have been redeemed, Jacqueline included two holes on each card and tied a small ribbon beside a hole that says ‘undone’. Every time the recipient claims another voucher, the ribbon is moved to the hole that says ‘done’. 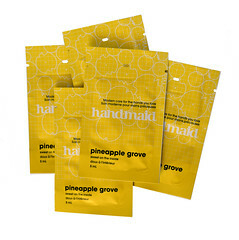 Punching a hole in the corner of each voucher allows you to hold them all together using a paper or binder ring. You could also hold them together with a pretty ribbon. Jacqueline also visited Karen for these fun button coupons. Look around your local craft shops to find somewhere that rents out a circle cutter and button press. You can also buy button making kits if you can’t find one to rent. 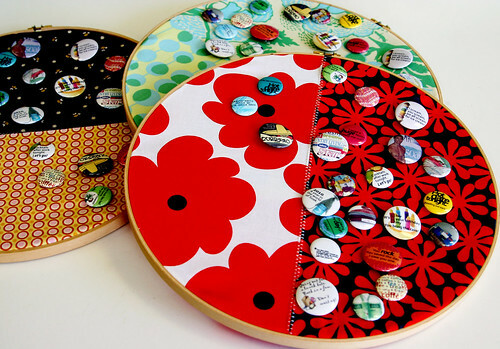 Jacqueline took a circular embroidery frame and put fun fabric in it to give a base for the buttons to be pinned to. Using two different types of fabrics will allow you to keep track of which buttons have already been redeemed. Start with all the buttons on one side, move to the other side as they are used. You can use magazine images, wrapping paper, or other fun colourful paper to make some decorative buttons to add some variety and color. Be creative. Add related images as background to the text to make the buttons more visually pleasing. Here are a few of my personal favourites. I tried to redeem the male model button. It unfortunately was just a decorative one. At least I tried. The ice cream button on the other hand was not decorative. Yum! Did you make any fun homemade gifts this season? I’d love to hear your ideas or send us your photos of the finished gift. We hope everyone has a wonderful and safe holiday.